3rd November 2014 – Every minute I can work on the Aquarel, I’ll try to do so. The ceiling is a major work. I have to do it alone and the sheets of multiplex are heavy. I already cut them in half, but even then, it is struggling to hold them while I add a few screws…. 18th October 2014 – A whole day spent on the stairs to the hold. Major problem is the small entrance. It takes time to measure and think! Th stairs are also the side cover for the water tanks. A difficult construction, but once finished, I think it will be a masterpiece. Or let’s hope so…. 15th October 2014 – It annoys me there is no progress to see or to show the people around you. I insulated the den on one side and put some wood over it. It is a small area, but it gives an idea . While doing so, some more of that big pile of wood is gone. Wall finished and floor visible! 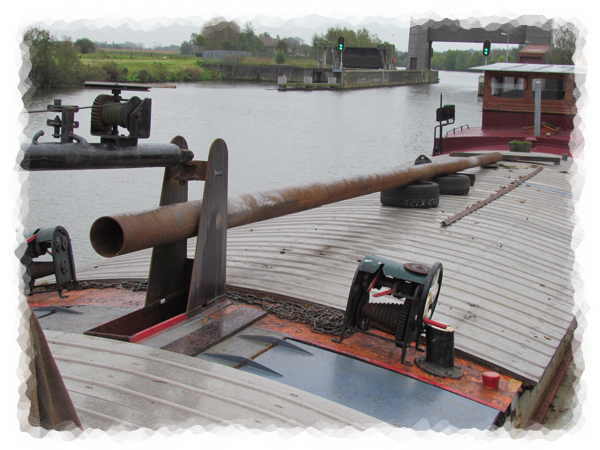 14th October 2014 – The engine arrived and this means another step closer to make the ship navigable again. We put it on the front deck with the help of a big car crane on the back of a container barge, so I have enough space to dismantle the old engine. 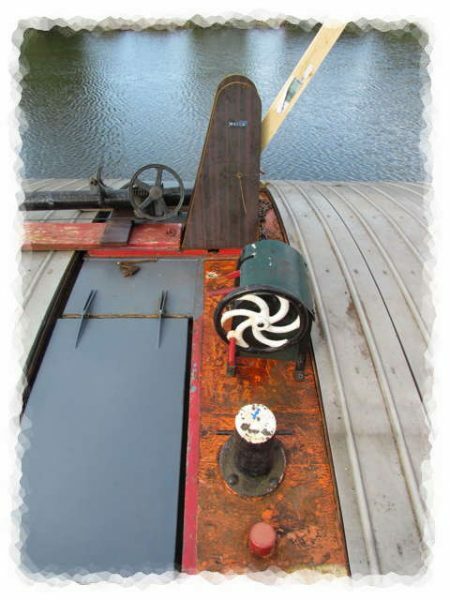 I will reuse the old engine as counter weight for the mast. 13th October 2014 – I’ve been looking for a replacement engine for some time now. It is hard to find the same engine at a reasonable price. I made plans for rebuilding the current engine, but nobody really knows what happened to it. 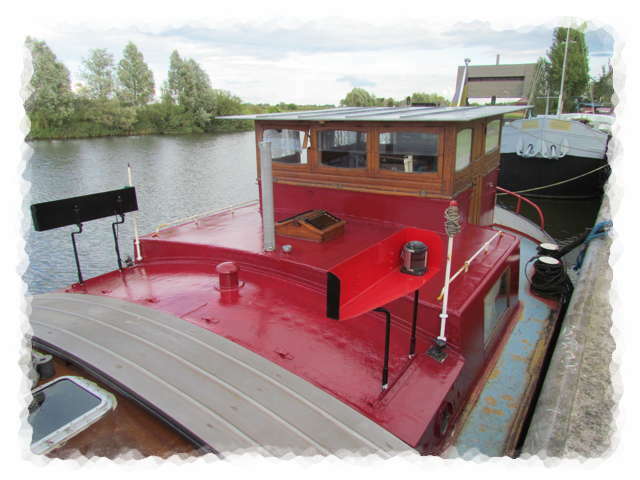 She was badly damaged the last journey and had severe frost damage from a few years ago. 12th October 2014 – Since I don’t stand stable enough on my foot to cut big sheets of wood, my father came to help. While he was working with the saw, I put silicon on all the welding joints. At least no condensation can come the joints of the metal sheets. I don’t know whether it will help or be of any use. It is something to evaluate when they scrap the boat. 11th October 2014 – The first serious day of working. It was raining so I jumped on two jobs, putting the mast together and welding the stairs to the hold. Aquarel – Back on track! 7th October 2014 – For over a month I hadn’t been aboard the Aquarel. Everything was there like I left it… I didn’t know where to start, so I cleaned up what I was last doing and continued insulating the den of the ship. 6th September 2014 – There are only 24 hours a day, no matter how I try to do my best…. I decided to dedicate the whole day to work on the Aquarel. While my mother did some painting I managed to finish some more of the studio in the hold. Two walls are finished and the frame for the ceiling was also screwed to the wooden beams. It took some time to get the curve right. I want to have a rounded ceiling, not a straight one. On the other side, I want to keep my ceiling height. The hold is undeep and I want to keep over two meters of standing height. 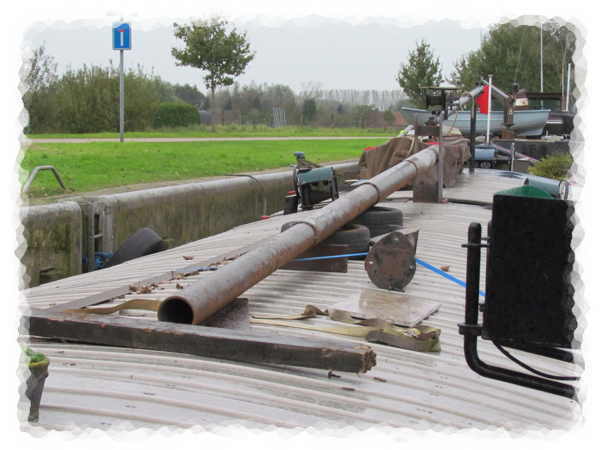 30th August 2014 – The cube for the the mast foot was welded today and tested. It was filled with water and only a few drips came out in the hold. It got another weld so it is watertight. The support was welded as well and the first bracket for the arm of the mast. The weather stayed dry so all the outside welding was done. My neighbours had a wedding party so we didn’t make it to late. A nice day and a lot of progress! 23rd August 2014 – Painting time. My mother came to paint the wheelhouse. By the end of this fine day, we got most of it done. 21st August 2014 – Since the welding around my kitchen is finished I can concentrate on the woodwork again. It took me some time to mount the frame and the steel wires to hold the insulation. 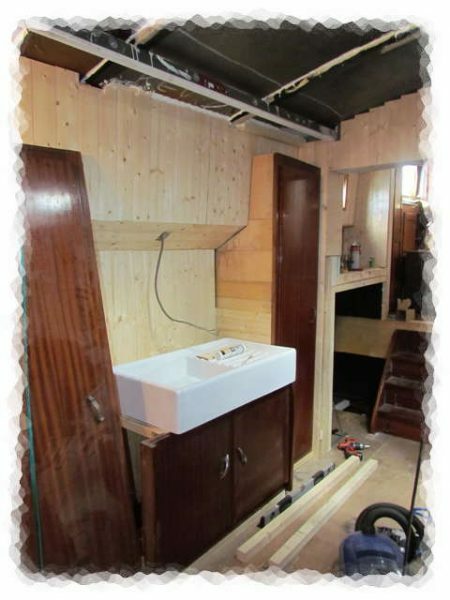 I’m surprised to see how much insulation that goes into a small area… Anyway, by the end of the evening the wall was finished to hold the kitchen sink and the other units. 15th August 2014 – A national holiday on a Friday. This is perfect for a long weekend of working aboard the Aquarel. The only element I couldn’t count on was the weather. The whole day was raining. Anyway, I managed to weld the remaining supports for the hatches. At least when it is stormy, I don’t have to worry to much about losing them. Heavy rain continued and therefore it was necessary to work inside. The metal framework for the watertanks was welded. The watertanks float above the wooden floor. In case I have to weld at the yard, I can get access to the bilges without moving my tanks.